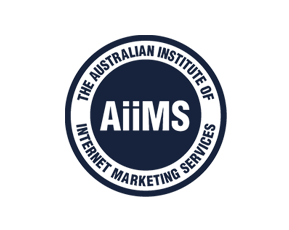 AdWords and the strength & weaknesses of each approach to online marketing. Where is your business Exposed? 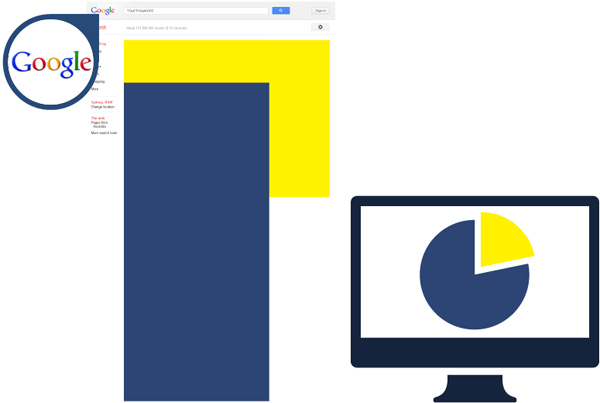 Here are your typical 1st page search results, the yellow represents Google AdWords and the blue represents the Organic Search Results (This is what SEO targets). The chart represents the average click rate of each result type. Smart SEO can get your site on the first page of Google results. Click advertising. They also include Google maps, facebook pages, etc. of any installed AdBlocking programs or searchers who ignore the paid results. going, and how much is going towards this goal? with more keywords, and your visibility continues to increase over time. 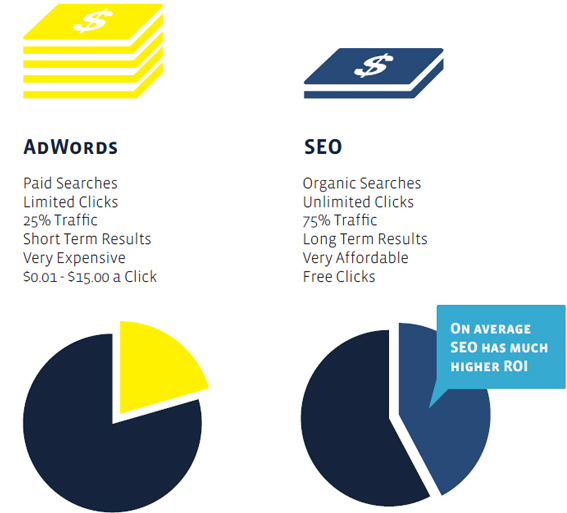 SEO has the highest ROI and the lowest ongoing cost. longer you continue with your SEO campaign the greater your results will be! the smart thing to do is maintain it if you want it to keep performing at it’s best, and if you stop maintaining it, its performance will decline, and eventually stop! improve your campaign and aim for those #1 positions in the Search Engines! Let our results do the talking! If you’re business isn’t on the first page of Google search results then give us a call and let us help you get to the first page!